Copenhagenize.com - Bicycle Urbanism by Design: Critical Miss or Critical Mass? Critical Miss or Critical Mass? Let's get one thing straight. While we're not banner-waving activists, we think activism is fantastic. We're all for it, especially the activism towards creating bike culture and infrastructure like we have in Copenhagen in other cities in the world. We just feel the need to play devil's advocate regarding the Critical Mass movement. Certainly the style of Critical Mass prevalent in, for example, North American cities. Rides that feature an aggressive, in-your-face tone. 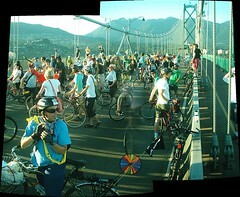 There are many positive examples of protest rides that are calm, cool and accepted. Budapest comes to mind. Even the rides in Prague - where they changed the name from Critical Mass to something akin to 'bike ride' in order to remove themselves from the North American versions. Generlally, it's a brilliant concept. Democratic to the core. Celebrations, even. Even if there are only a couple of dozen cyclists. Although we loved to ride in Budapest, with tens of thousands of other bikes. That would be a rush. We also think that movements like the Naked Bike Ride protests tackle important issues with humour. We despise the exaggerated crackdowns by police in various cities, but we're not too thrilled about those participatnts who are aggressive towards motorists. Democracy becomes anarchy. We don't fancy much the elitist attitude of many in the environmental activist movement either. Those who look down their nose at motorists - and even non-cyclists. We figure that the point of Critical Mass is to profile the need for bike culture and all the enviromental plusses inherent in it. A good thing. Therefore one of the primary goals is to get more people to ride their bikes. For whatever reason: sustainability, oil-dependence reduction, better health for fellow citizens. If so, does Critical Mass work? We don't know. 15 years on and are there any cities that have made massive gains towards a bike culture similar to many European cities? We do know that we see a simple alternative. An easier route. 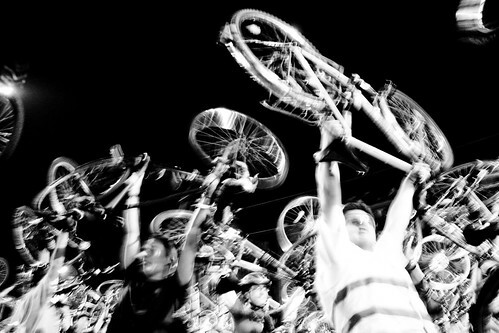 What if all those massers merely rode their bikes every day? In normal clothes, like normal people? Like the millions of citizens of Northern Europe. Meet our protagonist - Mr. Motorist. He drives to and from work each day as he always has. Listening to the same radio station. Same route, with minor variations. It's what he does. He is an average citizen in a car-based society. Like the vast majority, he is not an environmental activist and he never, ever will be. Mr Motorist looks out of the windows of his car as he putters through traffic. What does he think when he sees a hard-core, lycra-clad, cyclist or a sub-cultural fixie boy on a specialist bike speeding his/her way along the curb? Mr Motorist in the morning traffic might think, "Hmm. I could ride my bike to work, too..."
He won't, however, see himself reflected in the image. He'll see a member of an often militant sub-culture. He'll see somebody he would normally label as an 'environmentalist' - not a positive label in many cultures. He'll see a person wearing an unofficial uniform - Mr Motorist has nothing in his closet that even closely resembles the gear on the cyclist - and he'll see a bike so far removed from any bike he has ever owned. He'll realise that in order to ride his bike he would have to infiltrate a sub-culture populated by individuals very unlike himself. He would have to invest in gear and clothes. Worst of all, Mr Motorist would find himself 'making a statement' by riding. Mr Motorist, like most people, doesn't want to make a statement. He just wants to live his life, not climb onto a platform and become a visible statement-maker. He knows the environment is an important issue. He knows the facts. But he is just Joe Average and always will be. He just thinks riding his bike to work would be nice, healthy and quicker than driving. But the idea is quickly dropped. When Mr Motorist is stuck in traffic on the way home because of a bike protest/demonstration/celebration, he isn't going to be any closer to hopping on a bike. He will be pushed farther away from the thought than he ever was. Joe Average doesn't have much respect for this kind of activism. I wish he did, but he doesn't. He's just going to get pissed off. Now let's imagine Mr Motorist sitting in traffic and glancing out of the window. He watches a chap ride past. Briefcase strapped to the back pannier. Wearing a suit. Not flying along like he is out to break records, just riding steady. the only gear on him is clips on his trouser legs. Taking it easy, not challenging the motorized traffic, just working with it. Preferably cycling on safe, protected cycle tracks or bike lanes. The bike on which the man is sitting resembles the one in Mr Motorist's garage. And then Mr Motorist sees a woman pass by him. On a cool 'sit up and beg' bike. Her briefcase in her basket, adorned with plastic flowers. The basket, not the briefcase. She is wearing a skirt and stylish shoes. Listening to her iPod. A good, steady pace. Then, we dare to assume, Mr Motorist would think, "I wouldn't mind riding my bike to work. It's only 15 km. That guy looks like me. Same suit. Same bike. And that woman makes it look easy..."
Mr Motorist would instantly see his own reflection in these riders. He would realise that in order to ride to work he would only have to drag his bike out of the garage, invest in trouser leg clips. In far less time than it takes him to drive to work, he would be ready to ride. He wouldn't have to make a statement. He would just be another cyclist on his way to work. He would blend in. He would feel like he is doing something good for himself and for the planet. Without having to climb a soapbox to do so. Here's the rub. All those who are so passionate about helping increase bicycle usage in urban areas, understand how Joe Average thinks. Help Joe Average fit in. Don't alienate him by highlighting the differences between you and him. We're all in this together. Activists are first out of the blocks and more power to them, but it is Joe Average and his friends who will end up saving the planet, if given the chance. And when bike usage increases, bike accidents decrease and cities and towns will have no choice but to invest in infrastructure, facilities. If you build it, they will come. Make it look effortless and the journey towards a bike culture with be so, too. 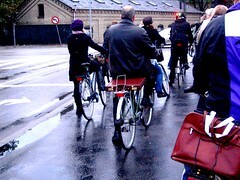 For more effortless bike culture images, see Copenhagen Cycle Chic. Critical Manners - a positive alternative.